Are your recruitment marketing emails to prospective high school students too long? I’m going to guess, yes. Last year I wrote a post about how to keep your emails from getting too wordy. Since then, I’ve written dozens of emails for various colleges’ application generation and search campaigns. My clients used to ask for 150-word emails. Now, that’s changing to be 100 words or less. But you know what happens? When university officials see the shorter emails, they often freak out. It’s not enough information, some may say. Can we add X, Y, and Z to this email?, they ask. Soon the emails balloon to double the word count with a lot of superfluous adjectives and non-distinct features of the school. When you’re sending more than a single email to students (and we know you are), be assured: it’s okay to have less information in each email. It may seem difficult or weird to get used to at first (and shorter emails may be more challenging to write), but students are bombarded with tons of information, especially information on colleges, every day. They see it online. They get it in their email inbox. They receive viewbooks and postcards in the mail. They see brochures at college fairs. Your emails don’t need to provide them all the information they “need” to know about your institution. Instead, the emails need to provide just enough information to pique the students’ interest so they take the action you want them to: inquire, schedule a campus visit, or apply. Don’t worry—even if your emails are super short, students will still get the information they need. Today’s high school students are great at Googling. They know how to find your website. Just take a breath, and let go of all the unnecessary words. And say hello to shorter, more concise (and hopefully more effective) recruitment emails. On a recent visit to a college campus, a roomful of students agreed on the one website they read/visit regularly: BuzzFeed. If you haven’t heard of it, it’s time you check it out. So what is BuzzFeed? It’s a “social” news and entertainment site that lets visitors rate the articles they read based on which ones make them laugh, which ones are “cute,” which ones “fail,” and more. The articles are short. They’re written in a straightforward, conversational, and slightly edgy tone. Many include images and/or videos. Many are written in a top-10 list style. Visitors can know which articles are most popular by viewing articles identified with the “trending” icon (the upward zig-zag arrow). Why should you get to know BuzzFeed? According to the site’s advertising media kit, BuzzFeed gets 175 million unique visitors each month, and 50 percent of those visitors are 18-34 years old. If you’re looking for a place to spend advertising dollars for transfer or young adult students, BuzzFeed might be worth a look. Also, if you want to get an idea for the tone and language prospective and current students enjoy, reading BuzzFeed articles and viewing their videos can give you inspiration for the tone and conversational style you may want to try using in your college’s marketing pieces. In my last blog post, I provided tips on how to find alumni information via LinkedIn to generate alumni story ideas. Today, I’ve got step-by-step details on how to find alumni employment data to use in your higher education communications and marketing materials. Step 3: Click the More link under either graph of data. This will take you to a page with one additional category: Where They Live. It also will show you expanded data so you can see more than the top four most popular places where alumni work and job titles that alumni have. Step 4: Use the arrows by the graph results to see even more data, including where they studied (so you can see what, if any, graduate schools your alums have attended) and what alumni are skilled at. Step 5: Use the data you find in marketing pieces. For example, use information on where alums have studied to show which prestigious graduate schools your alums have gone on to attend. Or, use information on where they work in recruitment brochures to say our alumni are employed at X, Y, and Z companies. Finding alumni success stories to share in alumni magazines, online news stories, and recruitment marketing materials can sometimes seem like a daunting task for college communications professionals. But with all the social media tools at your disposal, it’s never been easier to find out what alumni are doing. The next time you’re asked to find alumni story ideas turn to LinkedIn first. On LinkedIn, you can see aggregate data on companies that hire the most alumni from your school, and you can search by your college name to find alums and check out what they’re doing today. Here’s how. Step 1: Log in to LinkedIn and click on Advanced Search. The Advanced Search box will give you several options of information to enter. In the School box, enter your college’s name. Step 2: The default results will show you people from your school who share your connections. To search all of LinkedIn for alumni (not just your connections), check the All box under the Relationship section to the left of your results. Step 3: To review results, click on each page of results or the Next button. If you’re looking for a specific type of alum (such as a recent alum who’s been in the workforce less than 5 years, or an alum working in the financial services or hospital/health care industry), you can narrow results using the categories on the left: Current Company, Industry, Past Company, School, Years of Experience, Function, Seniority Level, etc. Step 4: Before you use information you find here, contact the alumnus or alumna to confirm the information is up-to-date. If one alum’s job or company sounds interesting, contact him or her to schedule an interview so you can learn more and get a story for your website or alumni magazine, or get a quote for a recruitment marketing brochure. 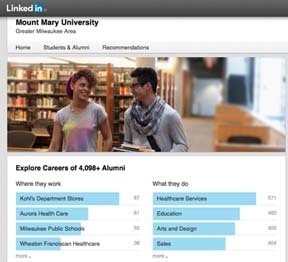 In my next blog post, I’ll cover how to find alumni employment data on LinkedIn. Over the years, I’ve seen numerous lists of words overused in press releases or other marketing materials. Today, I’ve come up with my own list of terms I see overused in college recruitment marketing brochures, advertisements, and websites. If you really want to set your school apart from others, avoid using these words and phrases that others use. In most cases, adjusting the copy slightly can help you avoid these overused terms. Additionally, if you’re looking for words to replace these overused ones, check out Rhyme Zone, an excellent free online thesaurus that provides not only synonyms, but also related words. Even if you don’t use any of the words they suggest, it may help you brainstorm and provide the creative inspiration you need. How do you avoid using overused terms in your marketing materials? Leave a comment on this post or tweet me @DanasCreative on Twitter. Before a recent campus visit at a small liberal arts college campus for a copywriting project, a colleague of mine and I discussed how to find the right voice to speak to prospective students in high school. She confided in me that she recently went to a local bookstore and picked up stacks of magazines, including Seventeen for girls and, for lack of a better option, a skateboarding magazine for boys. In the past, I had done a similar thing: looking to magazines that targeted at teens to discover catchphrases and study the tone of voice used. When we met with a group of current college students—mainly freshmen and sophomores—of the campus, our eyes were opened when we asked them what magazines they read. Of course this would be their answer. These students are part of the new crop of Generation Z students: the digital natives. Their answer reminded me that those magazines targeting teens are written by “old folks” like me, too, who are trying to be the voice students want to read. So how do you capture a voice that high school students want to hear? Read what teens are reading. Go to websites where teens go. And find content written for teens, by teens. Other studies show video-sharing site Vine and photo-sharing site Flickr increasing in usage among teens. If you’re not familiar with these sites, check them out. You may learn something about the teenage audience and their interests—and you can then adjust the voice and style of your copy to better speak to them. It also could inform your decisions on where to spend your online marketing dollars. When I first started freelancing I turned to blogs of men and women who had “been there, done that” to get advice on starting my freelance business. Today, I continue to read many of these blogs to stay inspired and to be up-to-date on the conversations others in my field are having. 1. Make a Living Writing. This blog by Carol Tice was a great help when I was first starting out, especially her posts about setting freelance rates, what different markets pay, and transitioning to a career as a full-time freelancer. 2. The Renegade Writer. When I was a summer editorial intern at Family Circle magazine, I remember fact-checking articles written by Linda Formichelli. I enjoyed her articles, and afterward I started seeing her byline in tons of places. I wanted to write for magazines like she did. When I was considering quitting my day job and becoming a full-time freelancer, I read Linda’s books The Renegade Writer and Query Letters That Rock (both co-written with Diana Burrell). I started reading Linda’s blog, too, which has even more practical advice for freelance newbies. 3. The Well-Fed Writer. Peter Bowerman’s The Well-Fed Writer was another book I read before getting the courage to make the leap to full-time freelancing. The book is kind of a no-nonsense guide of how to land copywriting work, and the freelance rate information in here was yet another super-helpful resource in helping me to determine my freelance rates. His blog has equally great advice. 4. MediaBistro. 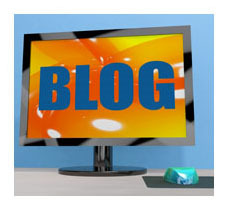 This site has lots of blogs, based on your interests in the media world, but what I found even more helpful than the blogs here were the site’s How to Pitch articles for tips on pitching story ideas to different magazines. It helped me land an article assignment from a magazine I hadn’t written for before. In my opinion, the MediaBistro subscription fee is well worth it. Dana’s Creative Services is a writing and editing services company that helps businesses communicate better with their target audiences. Dana McCullough, owner of Dana’s Creative Services, writes and edits copy for brochures, newsletters, websites, blogs, magazines, and books. Her clients include universities, nonprofit organizations, magazine publishers, and book publishers nationwide. Dana has a bachelor’s degree in journalism and frequently writes and edits copy on higher education, genealogy/family history, health, and business topics.